Max Factor have released a New Primer and I have it here to share with you all, I will also be comparing it to their first primer which is the Max Factor FaceFinity All Day Primer with SPF20. Max Factor have just released a new Primer in addition to their Range of Products. To Recap, Max Factor's first primer was the Facefinity All Day Primer with SPF20 which was released about 2 years ago and now we have a new Primer which is called Max Factor Smooth Mircale Primer * which as you can see has no SPF. The Lowdown, This primer is the new addition to the Max Factor Range and I love it. I have been testing it out for a couple of weeks and love the texture and feel of the new product. It is thicker that the Facefinity Primer and more like a cream so less is more with this product. The smell reminds me of skincare and suncream and that doesn't bother me at all in fact I actually like the smell. Key Properties include, Vitamin E, Green Tea and more for a younger hydrated healthy skin and the smooth like texture actually helps fill in any fine lines and wrinkles which will help create a smooth layer in preparation before applying foundation. 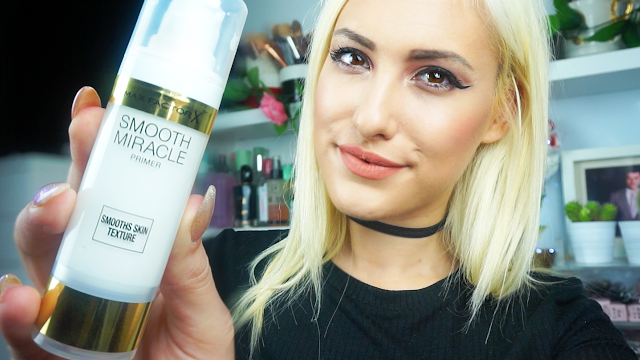 What they say, Max Factor Smooth Miracle Primer is the perfect base for an even foundation application. Instantly primes and smooths the appearance of skin. Overall, I am liking this new product that is on the market. Please make sure to watch the YouTube Review below to see the demonstration, tutorial and swatches of both Facefinity All Day Primer SPF20 and The Smooth Miracle Primer side by side and you can also see how smooth the face also becomes once applied.